From the darkest depths of our Brooklyn sound studio, comes a collection of samples like no other. 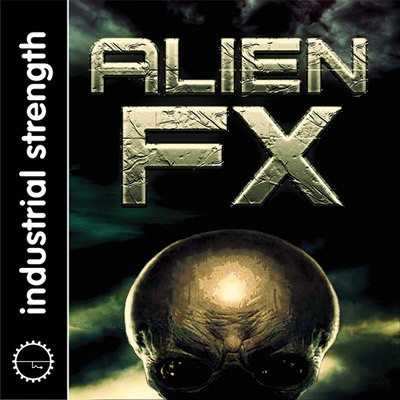 Alien FX is loaded up with over a gigabyte of rich soundscapes expertly crafted by Industrial Strength's audio designers. These spaced out samples are perfect for intros and transitions, and will add weight and texture to any electronic music production. The sounds in Alien FX are also intended for use in film, video games, sound art and live performance. Within this pack you will find over 250 samples, including, swells, drones, pads, atmospheres and complex soundscapes that feel like stepping onto an alien aircraft or a newly discovered planet. All of the audio samples are 24 bit quality and range in length from 3 to 90 seconds, already keyed, making the pack extremely versatile and ready to use without editing. What makes this pack so special is the careful process by which it was made. They were created with the best in digital and analog synths and then ran through our most advanced plug in's and analog filters to bring you big sounds with unique character. These are samples you simply won't find anywhere else but here. Industrial Strength's Alien Fx works perfectly with our Space Fx pack. when together these two sample packs will forge a super collection of out of this world effects which are great for Ambient, Lounge, Techno, Minimal, Drum n Bass, Deep Tech, Trance and Edm. So suit up, strap in and prepare to be lifted off to a sonic world that is without a doubt, alien.